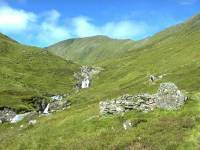 The day after the Guisachan Estate / Plodda Falls walk, the weather wasn't so good but Graham and I decided on a "multiple option" walk. 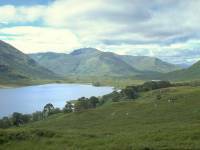 We'd start out on an anticlockwise walk around Loch Affric from the end of the public road, but if the weather looked OK and the fancy took us, we'd attempt a climb of the two highest mountains in North West Scotland - Carn Eighe and Mam Sodhail. 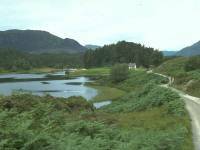 A path from the car park leads past Loch Pollan Buidhe, a tiny lake sandwiched between Loch Affric and Loch Beinn a Mheadhoin. 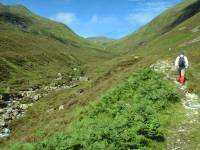 It leads past Affric Lodge, an outhouse of which can be seen a few hundred yards ahead. 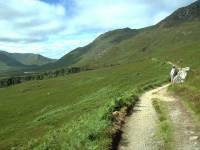 A plank bridge and a couple of crush gates in high deer fences prevent cyclists from using this path around the north shore of Loch Affric, but hikers are allowed. 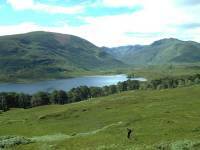 Even in this hazy light Loch Affric and its environs look very beautiful. 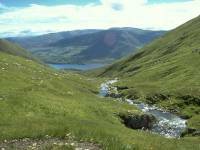 The path runs a couple of hundred feet above, and half a kilometre to the north, of the loch shore. 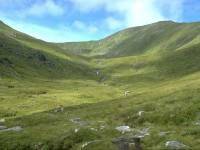 The weather is improving and Graham and I are minded to attempt the Mam Sodhail / Carn Eighe climb. 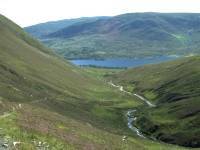 About two thirds of the way along the north shore of the loch, a path leads northwestwards into Coire Leachavie, which in two miles will rise to a col immediately south of Mam Sodhail. 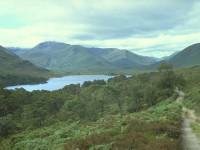 Loch Affric is displayed to excellent advantage from the entrance to the corrie. 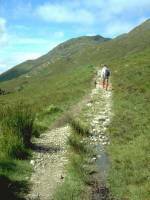 It always takes a significant physical effort to climb a mountain but some climbs are more straightforward than others. 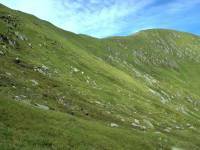 The path into Coire Leachavie proved to be an excellent route, reasonably graded and easy on the feet. We made good time up to the point where the corrie starts to take a left-hand turn. 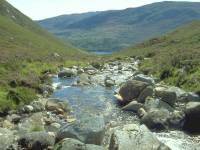 Higher into the corrie, and the gradual bend to the left is beginning to shut out the rearward view of Loch Affric. 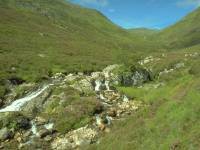 The Allt Coire Leachavie leaps down the corrie in a series of cascades and waterslides. Many of the cascades and the intermediate rockpools made very inviting picnic stops, but we were not yet clear of the midges and kept going. Loch Affric is still in view behind us. 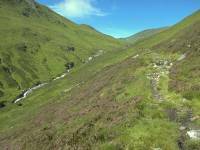 The Coire Leachavie path continues, now starting to deteriorate a little. We decided to stop for our lunch break up by the waterfall just ahead. 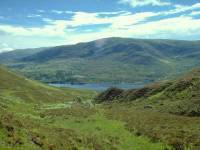 The rear view from the waterfall, and from here onwards Loch Affric could be seen no more. 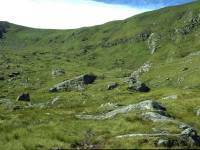 Upper Coire Leachavie. Mam Sodhail is the summit to the right. 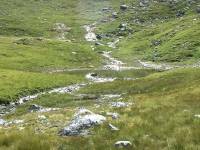 The path was a bit sketchy now and we were encountering the odd boggy patch, though since we had already climbed to over 2000ft it was hardly surprising. 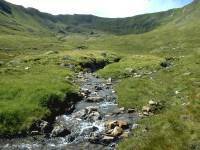 The upper corrie is a wild but beautiful place. A herd of deer grazed the slopes up to our left. 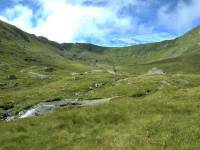 We did consider a very sketchy path rising up the corrie flank to our right but the slopes looked too steep. More worryingly, however, the corrie headwall ahead of us also looked rather daunting and we couldn't see the course of the path. 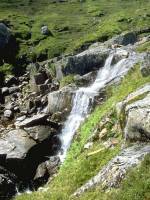 Another waterfall high in the corrie. At just above 2500ft the upper corrie starts to open into something of a cirque and the path gets sketchier, sometimes subdividing into more than one route as it wanders between the odd hump of glacial moraine. Getting nearer to the corrie headwall now, and fortunately we're starting to see suggestions of a path following a series of natural rakes zig-zagging up the slope. 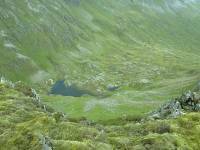 A tiny lochan in the bed of the cirque. ...from where it began to ascend the corrie headwall by a series of beautifully engineered and largely unobtrusive zigzags. 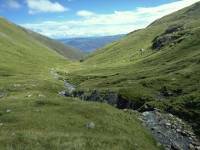 We've reached 3000ft and can see back down along the wild upper reaches of Coire Leachavie. 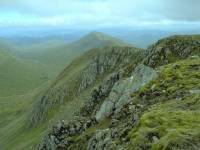 In the centre is Sgurr na Lapaich, at the end of Mam Sodhail's long east ridge. The same view, a couple of hundred feet higher. The path tacks back and forth as it climbs the corrie headwall. 3500ft above sea level now, and it almost feels as though we've cheated to have got this high without undue effort. The view back down the corrie from the same point. 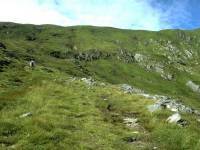 Almost up to the col now, and only about 300 ft of height separate us from Mam Sodhail's summit. The col! 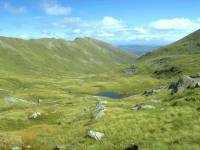 The Northwest Highlands are spread before us, with ridge after ridge disappearing into the distance. Sadly, we can name none of the peaks in view. 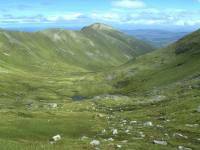 This shot is looking just west of north, with Carn Eighe to the far right. The summit dome of Mam Sodhail lies just ahead across a stony slope. The weather is still benign but we can see from the texture of the ground that strong winds regularly scour this slope from the west. 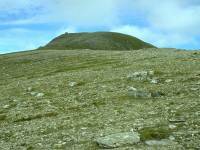 Mam Sodhail is Britain's 14th highest summit, at 3875ft or 1181 meters above sea level. 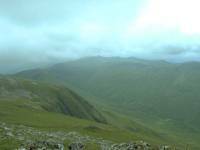 We're at the summit, from where we can see down into the bowl of Gleann nam Fiadh. Almost a mirror image of Coire Leachavie, immediately to the south, it contains its own cirque floored by the picturesque Loch Uaine (green lake). 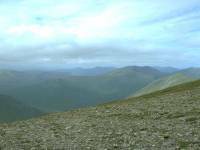 Mam Sodhail was my fifteenth Munro, and Graham's third. Sadly, the weather is turning. 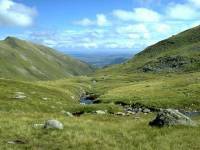 Carn Eighe, a kilometre to the north, is the highest summit north of the Great Glen; it's Britain's twelfth highest mountain, at 3881ft or 1183 meters. Graham is daunted by the reascent, and both of us are concerned by the deteriorating weather. 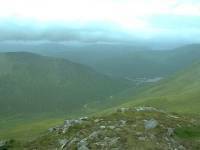 Dark clouds are approaching from the southwest and obscuring the tops in the Kintail direction. We decide to call it a day here on Mam Sodhail. Time for a couple more pictures, however. 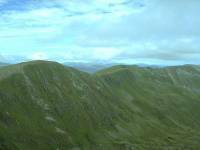 This is Mam Sodhail's eastern ridge, terminating in the shapely hump of Sgurr na Lapaich. The view southwestwards towards An Socach. 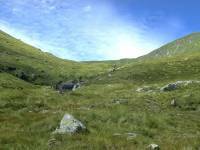 We decided to tackle the path along the lip of the ridge seen here, to reach the head of the Coire Ghaidheil and thence descend to the western end of Loch Affric by another stalkers' path. 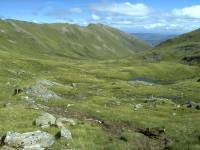 A parting shot from the summit, north-northwestwards down the Gleann Chollich to the headwaters of Loch Mullardoch. 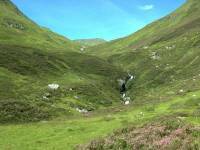 We failed to find the path into Coire Ghadheil, despite it being prominently marked on the map. Better safe than sorry, we climbed back up to the col and retraced our steps down Coire Leachavie. We reached the car at about 6pm, under intense midge attack; we were both weary and, with hindsight, were both glad we hadn't attempted Carn Eighe. But it'll still be there next year.